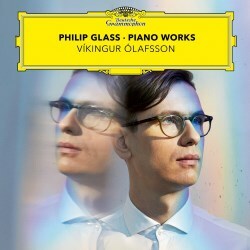 Víkingur Ólaffson has worked closely with Philip Glass in the past, and this very nicely produced selection of the Études has impeccable musicianship and an air of quiet authenticity stamped all over it. His booklet notes open with an anecdote that sums up Glass's unstoppable energy, the core of his attitude to the Études being that, "on the surface they seem to be filled with repetitions, but the more one plays and thinks about them, the more their narratives seem to travel along in a spiral. We never hear the same music twice as long as time continues to move forward, even if the chord progressions look the same on the page." Like that old saying about never being able to step into the same river twice, this is the kind of background thought that can help us as listeners, though Ólaffson also warns about "the very real danger of saying too much." It doesn't pay to over-think this music. Perhaps there are secrets to be discovered, but the secrets to be revealed are probably as much in ourselves as they are in the pieces themselves. Dynamic contrast and phrasing is a vital aspect of these pieces, and Ólaffson's touch is impeccable in this regard. The dramatic moments, such as the middle section of No. 2 are hard-hit and weighty, given the kind of orchestral sonority that sits alongside quieter, more chamber-music sections to turn this and the following No. 6 into kinds of mini concerti grossi. Talking of mini concerti grossi, what we also have here are a couple of reworkings of No. 2 and the second of the bookend tracks of Opening from Glassworks by Christian Badzura, whose name also pops up as Executive Producer of this recording. His addition of sustained string quartet notes in Etude No. 2 fill-in and enhance Glass's progressions, ramping up their cinematic appeal. The arrangement with Opening gives more independence to the strings, which develop their own ostinato patterns and add expressive elegance to the melodic line. This music works well in these kinds of arrangements, though we can argue as to whether this is an enhancement or just additional baggage until the bar closes and beyond. If you want Glass's complete Études then Maki Namekawa on Orange Mountain Records is pretty much unbeatable in terms of performance, though issues with regard to the recording quality also have to be noted (review). As a well chosen selection and a sublimely well performed and produced album this Deutsche Grammophon release has much to recommend it. With perfectly chosen tempi, Víkingur Ólaffson's playing combines late-romantic expressiveness, without too much rubato messing around, with the beating-heart-of-the-big-city energy which is exactly what this music needs. This kind of beautifully slick production won't change the anti-Glass lobby's mind in any way, but for fans this will be a juicy treat in which to wallow for a long time to come.